Babblings of a Mommy: Beauty Tip Of The Day: Calming Down Your Too-Tight Curls. Beauty Tip Of The Day: Calming Down Your Too-Tight Curls. Have you ever curled your hair for a wedding or special occasion and had it turn out more like Shirley Temple than Gisele? I have. This quick tip will help you remedy that in a jiffy. 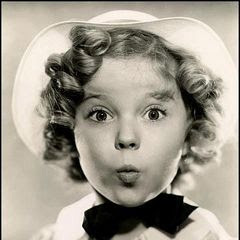 "If you've curled your hair with an iron or rollers and you're looking more Shirley Temple than you'd like, you can tame them in seconds. How? Easy. Simply spritz them with light-hold hairspray, then hit them gently with air from your blow dryer while pulling down on them. It will instantly soften the curl. "